Is civility among motorists falling by the roadside? Deputy Jared Gesler of the Allen County Sheriff’s Department, watches traffic along Fort Amanda Road in Shawnee Township. Troopers with the Ohio State Highway Patrol maintain a constant presence on area roadways in an attempt to keep motorists safe. Since June 1, Allen County Sheriff’s Deputies have initiated 752 traffic stops. Approximately 75 percent of those drivers escaped with a verbal warning, but 89 were cited for speed/assured clear distance violations, 24 where charged with operating under the influence and nine were charged with reckless operation. LIMA — The car in front of you is traveling 15 miles below the posted speed limit while weaving excessively. There’s a good chance some serious texting is going on up there. And there’s an equally good chance your blood pressure is rising in direct proportion to the driver’s declining speed. Meanwhile, the car behind you is tailgating so closely that you swear if you pop the hatch on your SUV, he’ll drive right in. A few miles earlier, you were stuck behind a motorist suffering from the “eventual left turn” syndrome. The signal’s been on for about two miles now. Surely he (or she) is coming to that turn-off sooner rather than later. But you’d better not pass him (or her), just to be safe. Road rage? Well, yeah, a little … you can feel it building. If you’ve experienced any, or all, of those examples of irritating driving practices, you’re not alone. The standards of road etiquette and basic common sense, many say, appear to be sinking to new lows. “It seems like people have just stopped caring about the rules of the road,” says Allen County Sheriff’s Office Deputy Jared Gesler. Gesler sees it all first-hand. He has been a deputy for more than three years, serving as a road officer, field training instructor and a member of the department’s SWAT team. He spends as large amount of his time traveling Allen County’s roadways, routinely putting more than 100 miles of pavement under his belt each day to ensure motorists are obeying state and local driving laws and that the roads are save for law-abiding drivers. Law enforcement officers see a smorgasbord of traffic violations in the course of a day, but some are becoming more prevalent that others. “We’re seeing a lot of texting while driving,” said Gesler. “We get calls from motorists who say they think a person (driving) is drunk, but when we stop them, we find they were just texting or talking on their phones. 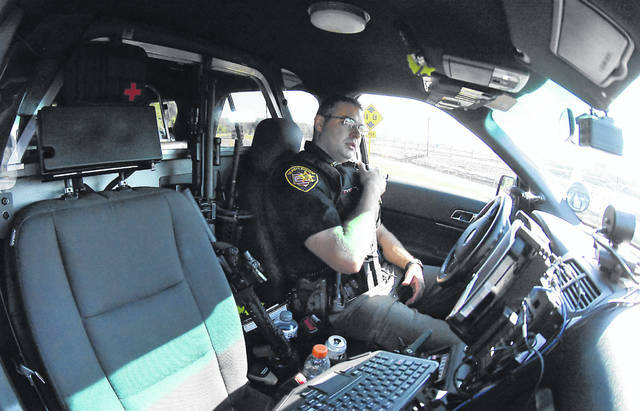 “Distracted driving is a pattern; it almost mimics impaired driving,” the deputy said. Laws on the use of cell phones vary from state to state, but in Ohio, it is illegal for adult drivers to use handheld wireless electronic communications devices to write, send or read text messages while driving. Drivers under the age of 18 caught texting or using any electronic wireless communication device while operating a vehicle face a $150 fine and a six-month license suspension for the first offense. The state law on texting and driving does not apply to vehicles that have stopped, and Gesler urges drivers who must use their phones to pull off the roadway to do so. The deputy said he has not yet issued a citation for texting while driving, admitting that the infraction is “tough to prove” in a court of law. “When during a traffic stop we find that phone use is the source of the distraction, we try to educate the driver on the hazards of texting and driving to prevent further problems,” he said. Sgt. Alec Coil of the Lima post of the Ohio State Highway Patrol knows a thing or two about distracted driving offenses. A few years ago he led the state in the number of citations issued for texting while driving or other offenses that fall under the broad category of distracted driving. Distracted driving is any non-driving activity a person engages in that has the potential to distract them from the primary task of driving and increases the risk of crashing. Distractions include talking to passengers, eating, adjusting the radio, using a navigation system and others. Coil said more and more people are driving while distracted, presumably because they are using their cellular devices while behind the wheel. “We at the Lima post have texting while driving as one of our Big Four enforcement targets,” Coil said. The other top priorities are operating while intoxicated, operating while under the influence of drugs and failure to use safety belts. While the act of operating a cell phone while driving is not a primary violation, “it’s a behavioral thing that leads to other errors — such as driving left of center, reckless operation, et cetera,” said Coil. The patrolman said the Lima post earlier this year received federal funding equivalent to 200 man hours of overtime to specifically target distracted drivers. An airplane was employed on some occasions to target motorists who were weaving their way down the highway. According to information provided by the patrol, female drivers statewide are more likely to use their cell phones while driving, but only by a slim margin over their male counterparts. Gesler said his emphasis while on patrol is simply to make Allen County roadways as safe as possible. Some drivers turn his goal into a real challenge. “People are in a hurry and don’t take the time to be considerate to others. Driving fast and recklessly will not get you to your destination much quicker” than following speed limit laws, he said. “Accidents are preventable. If I can get one or two people to slow down while I’m patrolling the roadways, it could prevent an accident from happening. And every drunk driver we get off the road is beneficial to everybody. Our mentality is that we like to stay productive and stay visible in the area. I believe we are doing something to make a difference,” Gesler said. “One big thing I’m seeing is people stopping beyond the stop bar at traffic lights. Drivers are stopping well beyond the line, and if someone comes around the corner and strikes then, who’s at fault?” Gesler asked, not entirely rhetorically. According to Andre McConnahea, public information officer for the Allen County Sheriff’s Office, since June 1 of this year, deputies have initiated 752 traffic stops. Approximately 75 percent of those drivers escaped with a verbal warning, but 89 were cited for speed/assured clear distance violations, 24 where charged with operating under the influence and nine were charged with reckless operation. Seven drivers were charged with traffic control device violations and another seven were ticketed for running a red light during that time span. McConnahea said that on average only one in four drivers stopped by deputies is issued a citation. Gesler said there are several factors in determining whether or not he will issue a citation. Asked if the attitude of the driver is a factor in whether a citation is issued, Gesler said it is not. “I understand people have bad days. A driver’s attitude never comes into the equation. The safety of your driving is my real concern,” the deputy said. Asked which age group of motorists — senior citizens or teenagers — presents the greatest public safety threat, Gesler had a quick response. Dozens of readers responded this week to a poll on The Lima News’ Facebook page asking which bad driving habits they find particularly annoying. Other respondents listed texting while driving, running red lights and tailgating to be among their top complaints.